World market leaders in Saxony-Anhalt believe in digital infrastructures. 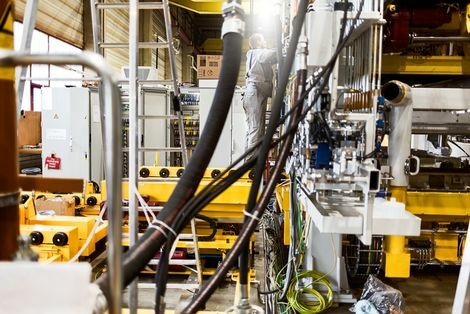 At the foot of the Harz Mountains, the future of manufacture as already begun: camshafts for the automotive industry are being manufactured here, in the workshop of ThyssenKrupp Presta Ilsenburg AG. Industrial robots are busily processing workpieces that need to be cooled, heated, aligned and pressed. Using barcode or Matrix Code scanners, RFID readers and tablets with data acquisition modules, workers listen in on the automated processes. They are in control of an ultra-modern production system. Its icon, one could say, is the tiny Data Matrix code lasered onto every camshaft. Every workpiece furnished with this digital marking, which resembles a QR code, is individually registered with the next machine – and thus has its own identity. That means the machinery knows whether the product has the correct status and is allowed to be assembled. This works because every camshaft is linked to the data network via an interface. With the Data Matrix code, each workpiece has an identity that it carries for the rest of its life, composed of information such as serial number, drawing number, part number and customer ID. It even possesses a memory. Every process step the workpiece goes through is namely recorded in the virtual memory for that component. Among other things, this allows the production schedule to be adjusted digitally at any time. Assembly lines and machines can be immediately modified with a new “formula”. At ThyssenKrupp Presta in Ilsenburg, Saxony-Anhalt, the physical world of things is fused with data networks to form a single system, a “cyber-physical system”, as the company calls it. This is exactly what the future of industrial production should look like. ThyssenKrupp is one of the world’s leading material and component suppliers for the automotive industry. The group employs around 1,900 people in Saxony-Anhalt. Around 850 of these are in Ilsenburg, where each year they produce roughly eleven million camshafts at ThyssenKrupp Presta and the neighbouring production plant of ThyssenKrupp Valvetrain GmbH – and they are global market leaders. Another site is the production shop for steering components in Schönebeck, which employs around 850 people. “As a major automotive supplier in Saxony-Anhalt, we face stiff international competition. To ensure we remain competitive in this market environment, we have continuously invested in the expansion and modernisation of our equipment and in our digital infrastructure in recent years,” says CEO Sascha Singer. The Schönebeck facility forms a production network with two other steering component factories in Mülheim an der Ruhr, Germany, and Florange, France. Within this network, virtually all process steps are digitally recorded by Data Matrix code and processed in real time. Universities and research institutions in Saxony-Anhalt are important partners to industry in the digital manufacturing trend. The Fraunhofer Institute for Factory Operation and Automation IFF in Magdeburg, for example, has been in the European “digital innovation hub” since 2018 – representing Saxony-Anhalt’s node in the European network for the field of digitalisation and Industry 4.0. Together with a consortium of universities and industrial partners from all across Europe, the IFF is working on the cutting-edge research project “ColRobot”. “We are developing solutions so that robots and humans in the assembly process can one day enjoy safe and mobile collaboration,” explains José Saenz, Head of the Robotic Systems business unit. This year, special camera solutions developed in Saxony-Anhalt will be field-tested in France. Clearly, safe collaboration between man and robot is a key element on the path towards Industry 4.0. Automation and digitalisation are becoming increasingly important in all industries. Matthias Bommert, CEO of IST Automation GmbH in Leuna, is well aware of this. Breweries in Liberia, sewage treatment plants in China, belt dryers in Scotland and a water supply in Germany – ISR Automation gets plants up and running everywhere in the world. “Things like virtual commissioning of plants, i.e. simulations, are becoming increasingly important for us, too,” Matthias Bommert says. Even now, digitalisation already plays an important role in the routine creation of hardware and software for process automation in the pharmaceuticals, energy, environmental, logistics and traffic sectors. NTN Antriebstechnik GmbH in Gardelegen, Saxony-Anhalt, has also set the goal of achieving utmost efficiency through automated manufacturing. Around 1.7 million spline shafts, joints and side shafts for the automotive industry are manufactured in a single run on their multi-machine production lines. For many, the road to Industry 4.0 is still a long one. The “smart factory” that runs fully autonomously, which learns and is flexible, is still just a vision. In Saxony-Anhalt’s plant engineering and construction industry, it is still above all the automotive suppliers who are already using “smart” production facilities. But, the other industries are quickly catching up.